Andrew Kim Blog: Why cells go bad: a new appreciation and understanding of ATP opens up an untapped avenue for fighting diabetes, cancer, aging, etc. Why cells go bad: a new appreciation and understanding of ATP opens up an untapped avenue for fighting diabetes, cancer, aging, etc. It’s refreshing to see people beginning to think clearly and rationally and move away from gimmicky diets that have little basis in fact, reality, or objectivity, and to ones that are firmly seated in all aspects of human physiology and science. After all, this is why most of us choose to eat a certain way, that is to be as healthy as we can be, both physically and mentally . . . not to, say, replicate how our caveman ancestors supposedly ate and lived. It’s important to point out that sugar is used by virtually every cell in the body to generate energy, or ATP. The brain is especially reliant on glucose for optimal functioning: The brain represents only 2 percent of the body’s total weight yet accounts for 15 percent of the body’s total energy expenditure. 1 Indeed, the brain is a voracious sugar guzzler, and sugar, not ketone bodies, is its preferred fuel source, despite popular discourse to the contrary. Insulin and sugar make us smarter 2 so it stands to reason that ketosis has the opposite effect. The oxidation of sugar, compared to the oxidation of fatty acids, generates ATP with a greater efficiency and oxygen economy. The excessive oxidation of fatty acids explains many of the processes that go off the rails in conditions like diabetes, in which diabetics are forced to burn fatty acids in proportion to their degree of insulin resistance. ATP is synonymous with life, and the efficiency and intensity with which we produce it is at the core of our resistance to stress and illnesses. I think most people are aware of the molecule, ATP, as it relates to providing energy in the form of high-energy phosphate bonds for nearly every energy-requiring process in the body. However, it’s becoming clear to more and more people that the energy gained from splitting the terminal high-energy phosphate bond is less than that gained from ATP simply sitting on its receptor sites on proteins inside cells. What is more, ATP, under resting conditions, needn’t be continuously broken down and rebuilt to maintain an unequal distribution of ions and solutes across the plasma membrane, and thus the volume and shape of cells and other subcellular structures. ATP, in its native state, is also now recognized as a neurotransmitter, growth factor, membrane depolarizer, pain perception mediator, nerve cell protector, cancer fighter, and intracellular signaling molecule (discussed later). Consider what would happen in the absence, or even reduced concentrations, of ATP, at the most basic level. The intracellular proteins, in the absence of ATP, would reassume their default, tangled form from their linear, extended form when ATP is bound. Cells would, as a result, no longer be able to exclude the passage of solutes, ions, and water, and in turn the cells would lose the ability to regulate their size, shape, and structure, resulting in their swelling, injury, or death—all initiated by the loss, or reduced generation, of ATP. Inside the cell, acting as a signaling transducer, ATP closes the potassium channels, and this has important effects that range from controlling the smooth muscle contractions of blood vessels to the secretion of insulin by the pancreas; 6 in the bones, activation of the ATP receptors stimulates the bone-building cells and inhibits the bone-destroying cells; and in the skin, the ATP receptors regulate the normal turnover of skin cells, so as to maintain the normal regeneration and healing of skin. One factor that stimulates ATP generation at high rates is the pro-metabolic hormone, insulin. Insulin is needed to metabolize glucose oxidatively, without which glucose would be converted, anaerobically, to lactate. Lactate, like free fatty acids, interferes with the oxidative metabolism of glucose. Figure 3 Fates of pyruvate. 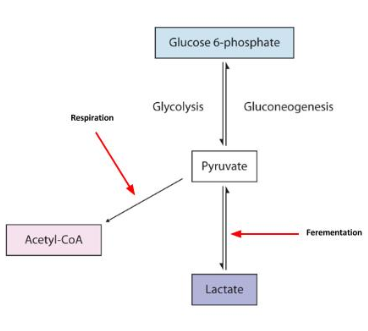 The generation of acetyl CoA, via PDH, generates carbon dioxide and leads to respiration; the generation of lactate, via LDH, is fermentation. Pyruvate is reduced to lactate when the PDH complex is inhibited as in when fats are burnt excessively. Insulin was, to the famous cancer researcher and Nobel laureate, Otto Warburg, a factor that checked the growth of tumors, and in the absence of insulin, glucose would promote it.7 It is now clear that insulin exerts this anti-carcinogenic effect by activating the enzyme complex, pyruvate dehydrogenase (PDH), which represents the bridge between glycolysis and the Krebs cycle. Cancer cells are defined, according to Warburg, by their large reliance on fermentation, via glycolysis, because respiration is injured or impaired, resulting in an energy deficiency. If we were to accept the theory of Warburg and others, that a high efficiency of energy generation determines structure, and that structure in turn, namely of the protein complexes of the respiratory chain, determines how we produce energy—via respiration or fermentation—then, glucose, oxygen, and insulin are the fundamental factors that make up the provision of support against cancer formation. Warburg also noted that the availability of blood sugar (in the presence of insulin) had no effect on the growth or survival of tumors, and so restricting sugar in hopes of staving off cancer is as fruitless an endeavor as restricting cholesterol to prevent cardiovascular disease, or restricting calcium to slow the progression of pathological calcification processes in the arteries, and so on. 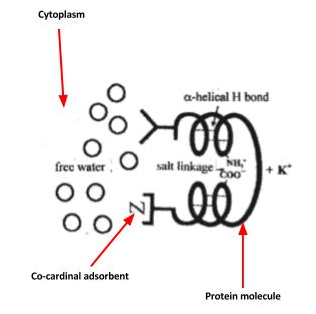 Figure 4 The carboxyl group (COO-) selectively binds to potassium (K+) when the protein is extended by the presence of ATP.4 It’s been shown that the loss of respiratory control parallels the loss of potassium, after which respiration comes to an abrupt halt.4 ATP and magnesium are needed to maintain K+ in its adsorbed state on proteins, so magnesium and ATP are co-cardinal adsorbents, if you will, and work together to maintain the respiratory chain. When the mitochondria are highly reduced, such as when an increased energy supply is unmatched by a proportional increase in energy demands or when fatty acids are burnt excessively or when oxygen availability declines, the proteins in the respiratory chain can no longer maintain their fully extended conformation, and as a result potassium and ATP are squeezed out of the mitochondria and are lost, and reactive oxygen species (ROS) are generated in high amounts. With this loss of ATP, the respiratory chain, in turn swells and destabilizes, and in conjunction with the increase in ROS, energy generation becomes impaired, reducing ATP availability further. Ultimately, the structure of the respiratory chains would be incrementally lost, and the cells would, like yeast, begin to rely more and more on fermentation—the enzymes for which are found freely in the cytoplasm—for energy. Herein we see that there is a strong association between respiration with structure and a lack of association between fermentation with structure. In addition to ATP, ubiquinone (a.k.a. CoQ10), NAD+, and iron (found in the cytochromes and iron-sulfur proteins) function as cardinal adsorbents in the mitochondrial respiratory chain. 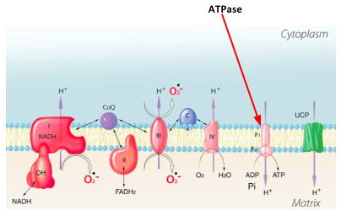 Essentially, these cardinal adsorbents, upon gaining or losing electrons, via long-range electronic effects, allow the shift in the preferential adsorption of one ion over another by the ATP generating enzyme, ATPase, as the ATPase enzyme is linked, electronically, to the entire respiratory chain. Figure 5 ATPase shown structurally and cooperatively linked to the respiratory chain along the inner mitochondrial membrane. Upon the continual replacement of respiration by fermentation, as the cells divide, the once highly differentiated cells in the body fail to develop and the looser the connection between structure and energy generation becomes. This is, according to Warburg, what cancer really is: A last ditch effort by cells to generate energy, by any means possible, in order to compensate for the energy lost by way of respiration because if energy generation were to fall below a certain minimum that is needed by the cell unconditionally, the cell would die. Sugar is beginning to be seen in a different light of late for reasons that I don’t fully understand by those who in the recent past, firmly held that sugar was a toxic poison. But sugar was already exonerated in the 1980s by major health organizations from the degenerative diseases that were being, speculatively, assigned to it. In reality, sugar, in the form of fruit promotes respiration and, in part through insulin, is protective against diabetes and cancer. Fruit supplies other nutrients that support respiration, including magnesium, potassium, vitamin B1, and vitamin c, which also promotes the absorption of iron in the intestines. Carbohydrates, in general, suppress the liberation of fatty acids and amino acids, and inhibit the production of ketone bodies and glucose in the liver, all of which prevent the oxidative metabolism of glucose, via the PDH complex, and interfere with the "delicately poised state" of the mitochondrial respiratory chain. Fructose, present in fruit but not starches, stimulates the synthesis of cholesterol more than any other single nutrient, and this means that ubiquinone would almost assuredly be produced in the amounts needed by cells. Sugar (e.g., candy, soda, pure cane sugar, etc.) can be eaten in small or modest amounts, but the lion’s share of one’s sugar should, ideally, come from fresh, ripe, organic fruit and fruit juices for the nutrients listed above. Losing excess body fat, if you have it, also tends to promote respiration, partly by lowering free fatty acids. To conclude, the generation of ATP supports respiration, and the rapid use of ATP without a proportional increase in ATP generation results in an increased reliance on fermentation, which can only support a primitive type of life; that is, one that supports growth without development. Insulin, glucose, and oxygen are at the core of our resistance to stress and illnesses. There are issues inherent in the excessive oxidation of fatty acids in preference to glucose, the reasons for which are beyond the scope of this post. (Though Danny Roddy explains it here.) However, suffice to say, glucose oxidation, more than fatty acid oxidation, supports a highly energized cellular state, per Dr. Gilbert Ling’s vision of cell physiology, and this in turn establishes a firmer connection between energy generation and structure, allowing cells—and by extension people—to exist at the highest possible state of functioning, refinement, complexity. 1. Guyton A, Hall J. Textbook of Medical Physiology. 11th ed. Saunders; 2006:1104. 2. Benedict C, Hallschmid M, Hatke A, et al. Intranasal insulin improves memory in humans. Psychoneuroendocrinology. 2004;29(10):1326–34. doi:10.1016/j.psyneuen.2004.04.003. 3. Szent-Györgyi A. Bioenergetics. New York: Academic Press Inc. 1957. 4. Ling GN, Ochsenfeld MM. A historically significant study that at once disproves the membrane (pump) theory and confirms that nano-protoplasm is the ultimate physical basis of life--yet so simple and low-cost that it could easily be repeated in many high school biology classrooms. Physiological chemistry and physics and medical NMR. 2008;40:89–113. Available at: http://www.ncbi.nlm.nih.gov/pubmed/20070042. 5. Burnstock G. Purinergic signalling: Its unpopular beginning, its acceptance and its exciting future. BioEssays : news and reviews in molecular, cellular and developmental biology. 2012;34(3):218–25. doi:10.1002/bies.201100130. 6. Burnstock G, Krügel U, Abbracchio MP, Illes P. Purinergic signalling: from normal behaviour to pathological brain function. Progress in neurobiology. 2011;95(2):229–74. doi:10.1016/j.pneurobio.2011.08.006. 7. Warburg O, Wind F, Negelein E. the Metabolism of Tumors in the Body. The Journal of general physiology. 1927;8(6):519–30. Available at: http://www.pubmedcentral.nih.gov/articlerender.fcgi?artid=2140820&tool=pmcentrez&rendertype=abstract. 8. Bargossi AM, Grossi G, Fiorella PL, Gaddi A, Di Giulio R, Battino M. Exogenous CoQ10 supplementation prevents plasma ubiquinone reduction induced by HMG-CoA reductase inhibitors. Molecular aspects of medicine. 1994;15 Suppl:s187–93. Available at: http://www.ncbi.nlm.nih.gov/pubmed/7752830. Accessed March 13, 2013. 9. Stacpoole PW, Barnes CL, Hurbanis MD, Cannon SL, Kerr DS. Treatment of congenital lactic acidosis with dichloroacetate. Archives of disease in childhood. 1997;77(6):535–41. Available at: http://www.pubmedcentral.nih.gov/articlerender.fcgi?artid=1717417&tool=pmcentrez&rendertype=abstract. Accessed March 3, 2013. 10. Sutendra G, Michelakis ED. Pyruvate dehydrogenase kinase as a novel therapeutic target in oncology. Frontiers in oncology. 2013;3:38. doi:10.3389/fonc.2013.00038. 11. Taubes G. Cancer Prevention With a Diabetes Pill ? 2012;335(January):2012. 12. McCarter RJ, Palmer J. Energy metabolism and aging: a lifelong study of Fischer 344 rats. The American journal of physiology. 1992;263(3 Pt 1):E448–52. Available at: http://www.ncbi.nlm.nih.gov/pubmed/1415524. Accessed October 16, 2012. 13. McCarter RJ, Herlihy JT, McGee JR. Metabolic rate and aging: effects of food restriction and thyroid hormone on minimal oxygen consumption in rats. Aging (Milan, Italy). 1989;1(1):71–6. Available at: http://www.ncbi.nlm.nih.gov/pubmed/2488303. Accessed October 16, 2012.